With 2 out of 10 teenagers in the US reporting that they have experienced bullying, devoting some time to generate a discussion among students is crucial. We have put together a collection of presentations, worksheets and bundles to help you create an anti-bullying culture in your class. 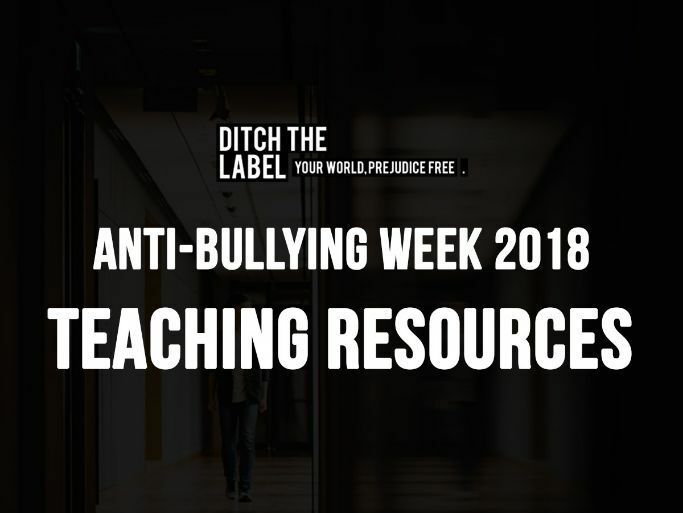 Try out these resources to talk about the impact, causes and ways of dealing with bullies and ensure pupils have a good understanding of the reality of bullying. To understand what bullying is and its different forms. To explain the emotional impacts that bullying can have. 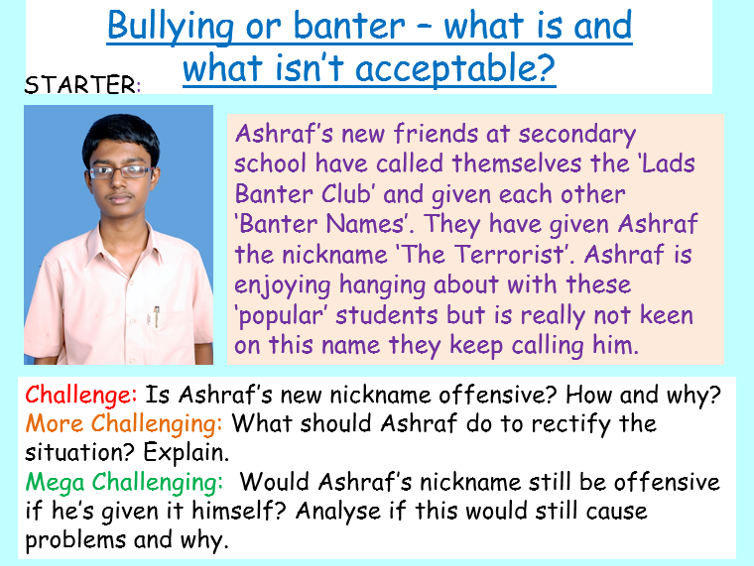 To analyse the ways in which bullying can be tackled. This is a powerpoint looking at the impact of bullying for year 7 pupils. A complete bundle of all of our 2018 Anti-Bullying Week resources - including 3 lesson plans with accompanying PowerPoints, as well as 2 assemblies and a list of fundraising ideas! Described by students as “brilliant!”, “thought-provoking”, and "a lot better than any lesson or assembly I’ve ever got from school or college”, these resources take a fresh and innovative approach to tackling bullying. Plus, in buying this resource you will be donating £2 to fund vital support for young people who are currently dealing with bullying. 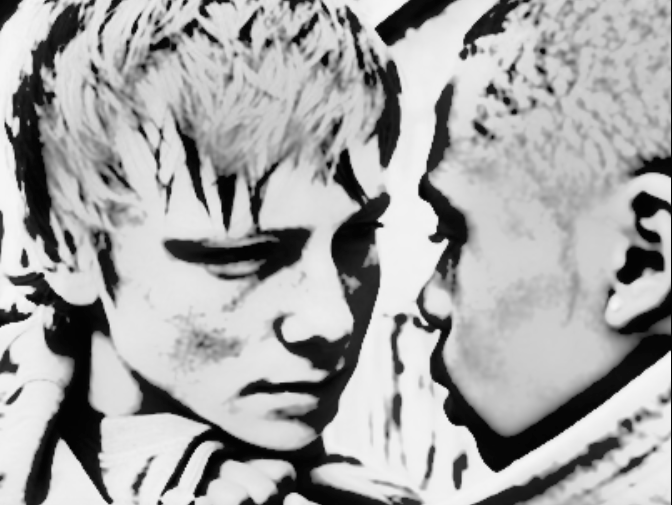 This lesson explores the root causes of bullying behaviour and encourages students to reflect on why people feel the need to bully others. It pushes high ability students to consider potential methods of combatting bullying through tackling the root causes. This lesson asks students to examine their own online behaviours and understand the consequences of some of their actions. 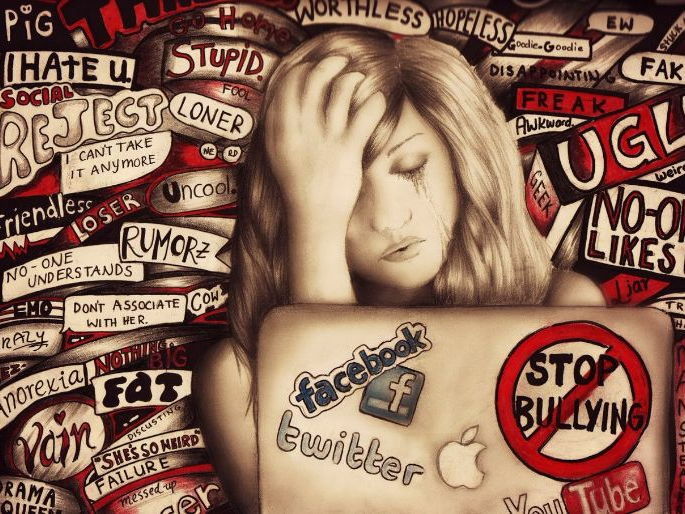 It allows them room to explore the subjectivity of cyberbullying behaviour and reinforces their responsibilities regarding their behaviour towards others online. This lesson encourages students to explore their own behaviour when it comes to witnessing bullying, and offers them guidance and encouragement to intervene in bullying situations, when appropriate. A fully scripted assembly which challenges current attitudes and approaches to bullying, through analysis of current data. A fully scripted assembly which explores the myths which surround bullying, and what people can do to deal with some of the issues they might face. Internet safety is a major concern when it comes to adolescents. Start a debate with your students on the dangers of cyberbullying and encourage them to reflect on realistic scenarios. I have used this resource on different groups of students from year 7-10 and it has proven effective for all ages. It's interesting that each age group has brought out its own conversations from this resource. I find it shocking how many young people (especially those below the required age of 13 to even have a social media account) are suffering from cyber bullying online and don't yet have the skills to handle it. This resource has made a significant difference to my students and I can only hope they go on to spread the word to others! 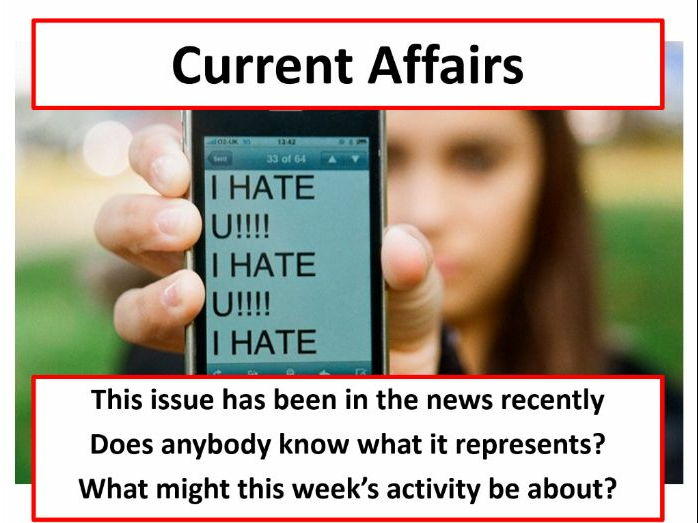 An engaging current affairs activity with videos, questions and a debate. New topical activity uploaded weekly! Please email me at josephcauldwell@mosslands.wirral.sch.uk if you would like the weekly PPT sent directly to your inbox. Please leave a review if you find this useful! Key Stage 3 and above powerpoint presentation on the consequences of cyber bullying and what young people can do to protect themselves. 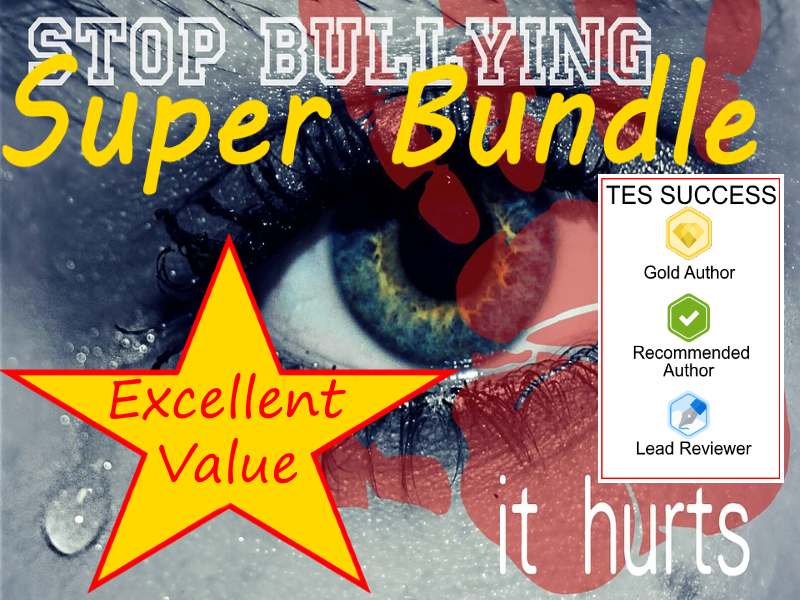 Check out these bundles that include posters, visual prompts and scripts about bullying and antisocial behaviour. This is a cross curricular teaching resource for talking about friendship, family and bullying. It provides you with the images you can use to discuss sensitive topics with your class. The anti-bullying posters could be printed off and shown all around your school. Likewise, they could be used to inspire a class to create their own, more personal and targetted versions.